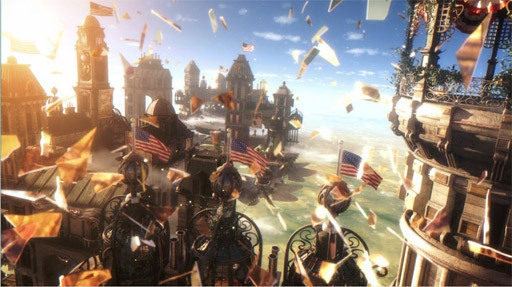 Radiator Blog: The shadow of the white cloud: architecture criticism at the 1893 World’s Fair and BioShock Infinite. The photo is black and white, but presumably we’re not really missing much. Everything was white. Tesla beat Edison in winning the contract to light the exhibition; imagine you had one of those 5 W light bulbs lighting your house, with the approximate output of a birthday candle, and now imagine you’re standing there at the water along those gleaming orbs and pristine white buildings. You probably would’ve been impressed. It was, and still is, a deeply influential current in America today. If you see a civic plaza with white columns, it’s probably there because of this expo. Grand Central station, San Francisco’s Civic Plaza, Doe Library / Wheeler Hall at UC Berkeley, etc. the list is quite long. New urbanism inherited many of its ideas too, such as the walkable city and focus on parks. Again — it was influential. Some sympathized with Sullivan; Burnham offered a scholarship to a young prodigy named Frank Lloyd Wright to study at the Ecole de Beaux-Arts in Paris — which Wright promptly declined, presumably because he more or less agreed with Sullivan that the Beaux Arts style wasn’t bold and dynamic enough. It’s important to note that history tends to associate modernist architecture with leftist ideals / internationalism, but these early American modernists didn’t see themselves like that: they were arguing for American exceptionalism too, just a different kind. Frank Lloyd Wright famously called Mies Van Der Rohe’s Farnsworth House “totalitarian” and “unamerican,” though today, the average person might be hard-pressed to see the difference between blocky modernist house A and blocky modernist house B. 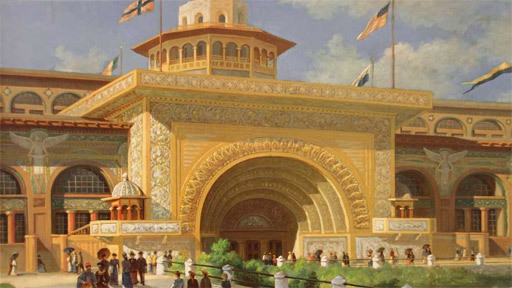 Other critics were more mixed about the architecture at the World’s Fair. Montgomery Schuyler said it was good — just as long as we didn’t see it as “real” architecture, much as how we don’t treat Disneyland like a real place but still enjoy pretending it’s made of magic. Another critic, Paul Bourget, agreed with American modernists that it was imitation of a previous age’s architecture. But in this case, imitation was acceptable. 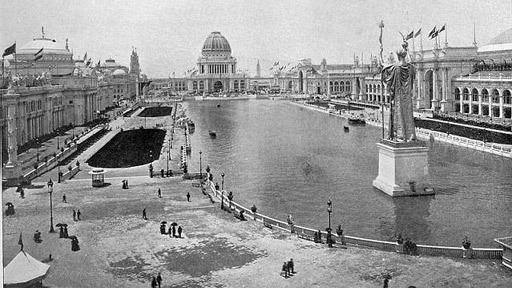 What mattered more was simply that American architects came together to build a neoclassical Disneyland in the middle of Chicago within a few years, and got it done: that the work and sweat of the whole enterprise demonstrated the vibrancy of American democracy. Henry Adams found it a bit troubling, the idea that American wealth could just buy and build an architectural style from somewhere else. 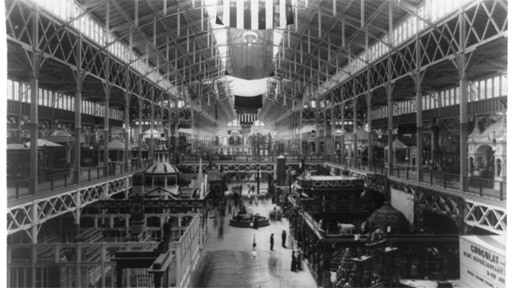 It was a hollow architecture — in their style, and also in their design, as the World Fair buildings were designed to be temporary. These days, though, I’d argue that America has more or less stolen neoclassical away from it’s origins. b) this was maybe the first time that everyone, even ordinary people who normally wouldn’t care, started asking how America projects its power through its buildings — and my professor argued that the second national dialogue wasn’t until 9/11, so this moment is pretty important. Consider the fact that the American embassy in London will have a moat built around it; that’s the influence of 9/11. 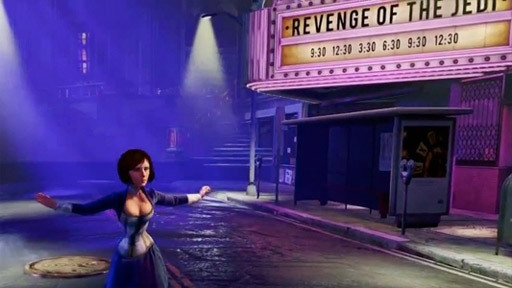 As for how these ideas could appear in BioShock: Infinite? 1) with their use of those scripted dimensional space-time teleportation sequences, feature present day buildings that strongly resemble Columbia’s more neoclassical buildings. Real world recognizable buildings. At first you might think you're on a fictional floating city, but surprise, the boss fight is actually in front of the New York Public Library! 2) pose the neoclassical architecture in conflict with more modernist architecture / proto-art-deco, though as I’ve explained, that’ll be a bit disingenuous in casting American modernists as left-wing internationalists when that wasn’t necessarily the case. 3) or maybe they’ll do nothing with it, as it doesn’t really fit neatly into the Occupy-inspired narrative they’re doing, and the movement’s improvised camps and architectures. 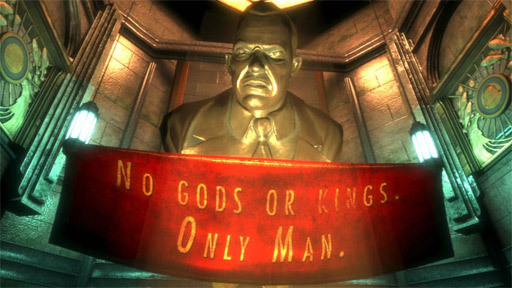 Three factions would be cool (Columbians vs. Occupiers vs. Modernists) but probably a bit too much to juggle for gameplay / narrative reasons, as three faction fights in Halo would almost always boil down to two within a few moments.